I was a nerd growing up. I still am a nerd, but not nearly as much as I was during my teenage years. This is not necessarily by choice. The unfortunate byproducts of adulthood - including fun things like Earning a Living and Cooking for Yourself - have prevented me from devoting as much time to my nerdy endeavors as I used to. At some point along the way, I also decided that I wanted a social life, which hasn't been kind to the weekends I had formerly reserved purely for nerdy activity. My nerdiest years were filled with constant reads and rereads of fantasy and science-fiction novels. I would ride by bike to the library and peruse HTML for Dummies, hoping to pick up a few tips for web design. My weekends consisted of playing board games late into the night with my other nerd friends - I have the board to Monopoly memorized and have over a dozen opening moves to Diplomacy mastered. Even with the advent of adulthood, I still try to carry the torch for nerdiness. (I still bought the last Wheel of Time book on the release day, after all). But I've also noticed a shift in the winds over the years. Perhaps it was just the social hierarchy of primary school, but nerds used to be shunned. I used to sit at the end of the lunch table and read my Star Wars novels while the other kids traded baseball cards. In high school, when my group of friends would convince a girl to play Diplomacy with us, it was a huge event. It wasn't the hellhole portrayed in movies - most students were kind to me - but it was clear that I was not on top of the social ladder. But something has changed, and I can't quite put my finger on it. There are small indications of the turning tides: for one, my mother, who at one time couldn't figure out how to scroll down on a computer window, now reads Wired on a regular basis. I trace the nerd revolution back to the films released at the beginning of the last decade. Specifically, when the Lord of the Rings trilogy was released, I went from being that weird kid who read those dense books with ridiculous cover art to being that kid who knew how the movies were going to end. I was never so much a comic books geek, but the rise of franchises like Spiderman and X-Men around the same time proved a point to the world. Nerds weren't yet cool. But they had lots of money, and they were willing to spend it on nerdy things. The subsequent rise in importance of technology over the next decade helped nerds out a lot. Nowadays, it's more important than ever to make friends with someone who can help you with your computer problems. All of us nerds slavishly working on our Geocities and Angelfire pages in the 1990s might have seemed pathetic, but really, we were anticipating the rise of social networking and Web 2.0, where everybody and their obscure hobby have a huge online presence. Mark Zuckerberg, a nerd if I ever saw one, is now worth more money than I will ever see in my lifetime. Now, nerd-dom reigns triumphant. Comic book and science-fiction movies rule the box office - hell, last year both Avatar and District 9 were nominated for Best Picture. Comic Con used to be a ghetto where nerds would go to get a few autographs. Now, it's front page news. So is E3, formerly a trade show for vendors. In movies, characters who know about computers have transformed from comic relief to badass dudes who frequently get laid. But herein lies the problem, and the main reason that I'm not completely ecstatic about the rise in nerdiness - our victory is a Pyrrhic one. Yes, science-fiction movies are finally accepted as cinema. Yes, Watchmen, Neuromancer, and Snow Crash all somehow made it on Time's list of best books since 1923. Yes, everyone is on the Internet now and people with computer skills are in high demand. Yes, they're even making a Monopoly movie. Yet I can't shake the feeling that it's not the nerds who are in control, but a bunch of corporate moguls who have figured out how to take advantage of the nerds. Nerdiness has become a spectacle - events like Comic Con are supposedly for the nerdy, but now they're nothing more but clever advertising by firms trying to appeal to nerds. Nerdiness is cool, which by definition makes it no longer nerdy. I'm happy that a lot of the things I like have achieved such success. But it seems that nerd love is not so much for the actual works anymore, but instead some sort of competition to be the first, the best, the most nerdy. It's about the guys who camp out in front of Apple stores to get iPhones, or the people who make ridiculous character costumes at the Cons. It's no longer about the bespectacled kid in the back of the classroom. 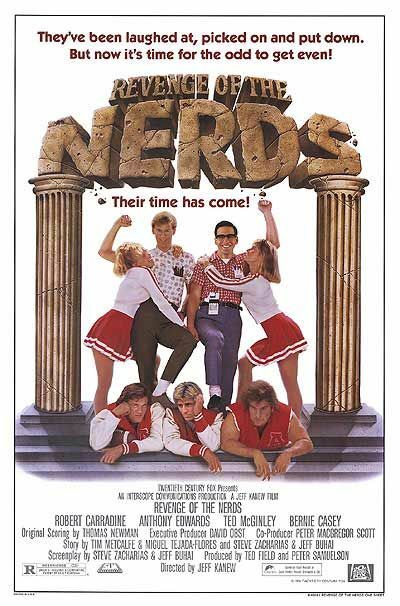 Nerds used to be a community, gathered together through social necessity to avoid getting the crap beat out of them. Now, it's become a competition among fanboys - who can prove themselves the most devoted? As Roger Ebert pointed out, the emphasis is on the fans, not the work. Nerds used to be the servants of the works they consumed; now, they long to be its masters - to be, paradoxically, the most popular nerd in the room. The nerds have won. Everyone uses computers. Everybody watches science-fiction and fantasy movies. The money in our pockets dictate the projects of Hollywood. But I can't help but feel that the victory is hollow. Nerdiness is everywhere, but it's too slick, too cool, too obsessed with its own image. I look at the revenge of the nerds, and I can't help but think this is not how I hoped it would be. Because as nerdiness becomes more and more popular, it's also more and more likely that such nerdiness will be formatted to appeal to nothing but the lowest common denominator.